Brazilian police say they have made their biggest-ever seizure of cash in an apartment allegedly used by one of President Michel Temer's former cabinet members. Police say they have counted more than $16m (£12.5m) in large-denomination notes found in the flat in the city of Salvador. Former minister Geddel Vieira Lima is under house arrest. Mr Temer is fighting a corruption crisis that has shaken his government. 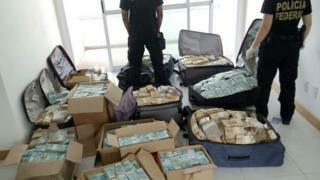 The cash seizure was part of the police's Operation Lost Treasure. Mr Vieira Lima was arrested in July as part of of a corruption investigation into a government-controlled bank. Prosecutors say he tried to block investigations into state bank Caixa Economica Federal. Mr Vieira Lima, who was in charge of relations with Congress, resigned from his role last November after a former minister accused Mr Vieira Lima of pressuring him to approve a property investment. Brazil's prosecutor general also charged Mr Temer and an aide with corruption - but last month the Brazilian Congress voted not to put him on trial for corruption. Opposition lawmakers in the lower house of Congress failed to obtain the two-thirds majority needed to send the case to the Supreme Court. Who is the man who now leads Brazil? The charge against Mr Temer came after a business tycoon secretly recorded a conversation with the president in an unofficial late-night meeting, which he revealed in May in a plea bargain deal with prosecutors. During the conversation, Mr Temer appeared to endorse the tycoon obstructing the investigation and bribing politicians. Mr Temer has said the footage is authentic, taken from a meeting in March, but he has strongly denied wrongdoing. His administration has been bogged down with a string of corruption scandals since he took over from former president Dilma Rousseff in a controversial impeachment process.